Kathy and I have great news for you. We finally finished a manufacturing run and we once again have the 9-pound size IN STOCK. How much did we make of the 9-pound size? Just under 7,000 pounds. Will it sell out soon? Probably. What should you do? It might be a GOOD IDEA for you to order TWO of them if this is the size you prefer. We try to forecast the amount of each size so we run low of each size at the SAME RATE. But guess what? Over the years we’ve tried to get it right, but never have. If you LOVE the 9-pound size, you BETTER ACT NOW. Here’s a story you might enjoy. Also, do you work in a school or know someone who does? You’ll see why we need to know that just below. Trust me, I pretty much GUARANTEE you’re about to discover something NEW about Stain Solver you didn’t know. Seriously. Yesterday, I couldn’t stand it any longer. Kathy and I have a fourth child you may not know about – Lady the Dog. She’s a gorgeous German Shepherd and will celebrate her tenth birthday this July. But she’s a messy eater. If you want to see an animal inhale and splatter food, then stop by my house about 2:30 PM each day. 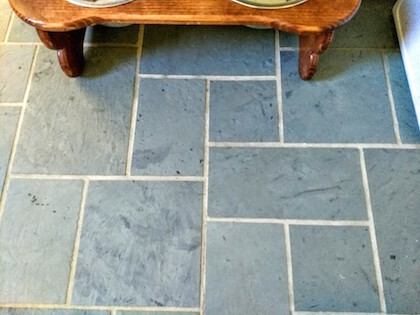 I’ve been putting off cleaning the floor by Lady’s food dish because I wanted to capture a great before photo of the disgusting mess on our natural slate floor and the sanded grout between the pieces of slate. I think you’ll agree I probably didn’t need to wait this long. Lady splatters the canned dog food she gets for lunch and then steps in it is my best guess. You can see how she’s messed up the small throw rug. That’s a story for another day. I grabbed some of the Stain Solver that Kathy and I make. It’s a certified organic oxygen bleach if you’re a new subscriber. When you mix the powder with warm water and stir it for a minute, you end up with a magic cleaning solution that works on anything water washable. Here’s why Stain Solver is magic. I may have never shared this with you. The first thing to remember is once you mix the powder with water, you create trillions of oxygen bubbles that start to clean on their own! 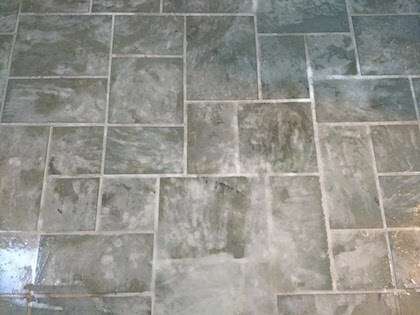 The next photo shows what the floor looked like after I poured on a thin layer of the solution onto the slate and grout. The white blotches you see are the countless oxygen bubbles scrubbing the slate and grout. You can actually look close and see the bubbles moving around. Here’s another thing I don’t believe I’ve ever shared. I allowed the solution to work on the grout for about twenty-five minutes. 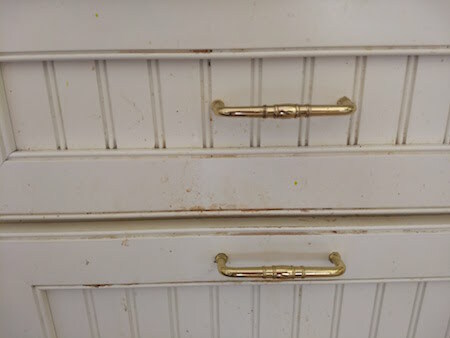 When you allow Stain Solver solution to stay in contact with whatever you’re cleaning for twenty, or more, minutes you achieve a 99 percent bacteria kill! Because I allowed the solution to soak for nearly 30 minutes, the floor under Lady’s dish was not only clean, but it was also safe for her so she’d not get sick. That’s important to Kathy and me. I got out my standard scrub brush and lightly scrubbed the slate and grout lines. Then I used my large sponge to rinse the floor with clear water making sure all dirt and grime was off the floor. Do you want to deep clean your tile, slate, or natural stone floors? If your flooring can stand water getting on it, then it’s safe to do what I did above. It works great on poured concrete floors in garages or basements too. It’s safe for epoxy-coated floors in garages or commercial buildings. Don’t believe me? You’re a Doubting Thomas? Go ahead, gamble ten bucks. Purchase just one of the small sample bottles and give it a try. There’s no photoshopping in those photos. Stain Solver is the real deal. 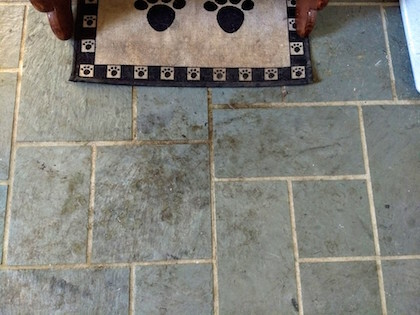 You can have clean and bacteria-free floors for yourself and your pets!!! CLICK HERE to order MORE magic Stain Solver. Oh WAIT!!!! I almost forgot to ask you!!!! Do you work in a school or know someone who does? Last week a middle school in California placed a REFILL order for 350 POUNDS of Stain Solver! They use it all over the school to keep their kids clean and safe. Kathy and I would appreciate it if you’d help us get Stain Solver into as many schools as possible. It’s certified organic and it’s made in the USA with USA ingredients. Please EMAIL me and put me in contact with the facility manager at your local school. Last week, a middle school in California placed a REFILL order for 350 POUNDS of Stain Solver! They use it all over the school to keep their kids clean and safe. 10% off any order greater than $48. Valentines Day is hours away! It’s time for a We Love You Sale. Details after this short story. Kathy and I are quite sure we’ve not told you how much we love you all these years. The first thing to remember is you may do the opposite. You may be one that’s sent us a recent message to us saying how much you love Stain Solver. Just last week, I used it at home here to do two things. I grabbed a mug and was about to put it in the dishwasher, but noticed it had deep tea stains in it. All I did was fill the mug halfway with hot tap water, drop in the Stain Solver powder and walk away. I came back two hours later, dumped the solution into the sink and this is what I saw. NO scrubbing required! 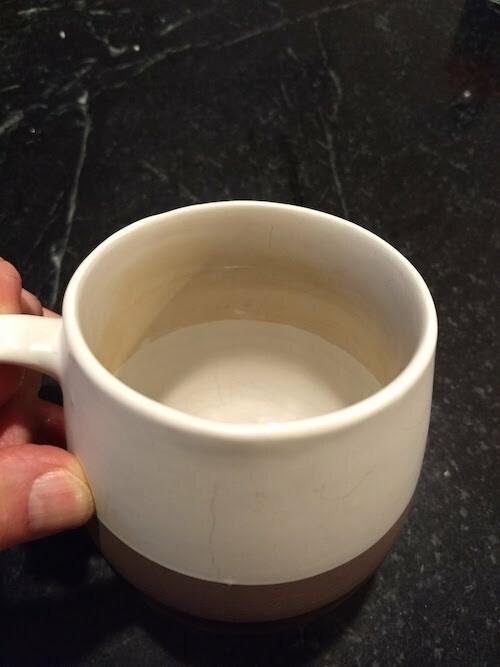 Look how easy it is to clean all your tea or coffee-stained mugs! The second thing I did was clean off all the internal wash arms and internal filters in my dishwasher. If your dishwasher is like mine, all the parts get greasy. This grease is one of the reasons your clear glasses might come out a little foggy from time to time. The grease accumulates inside the machine even though I try to wipe off as much grease as possible from the dishes before putting them in the machine. Every ten loads I put two tablespoons of Stain Solver into the machine just before turning it on. I always set the wash cycle for the longest one when I do this to allow the Stain Solver solution plenty of time to swish around the machine. Right now my dishwasher looks brand new inside! Yours can too if you add Stain Solver to it every now and then. 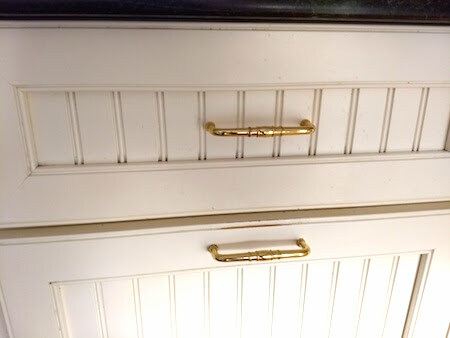 If you don’t know how to do it with Stain Solver, either ask me or call Ellen. 1-513-407-8727, M-F 9:00am – 2:00pm est. We need to lower the inventory of our 4.5 size. It’s one of our most popular sizes. If you spend $48.00 or more, you can get 10% off and FREE SHIPPING. This sale is only going to last one week. I’ll be sending out a reminder in a few days, but just order now. Thanks so much for your continued trust and business. Tim Carter here. Long time no contact! Sorry about the broken images. (Broken links were in the email, not on this website.) I’ll fix that soon, but for now we’ve got bigger and more important issues. We’re about to manufacture another TEN TONS of product and want to be sure we make enough of the SIZE YOU PREFER. SALE ENDS Sunday at midnight. Don’t STRESS when someone spills something on that heirloom tablecloth!!! Stain Solver will clean it the next day.